A cheerful springtime favorite! 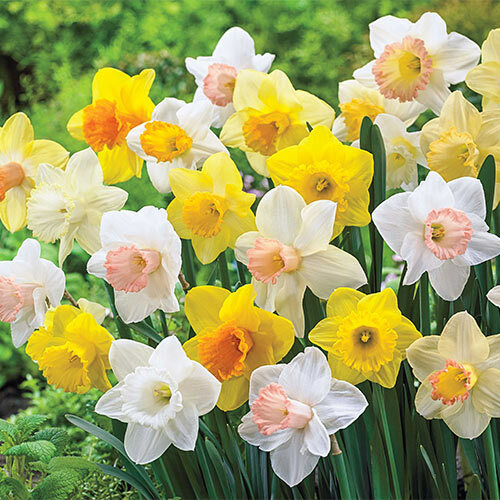 Giant Trumpet Daffodils for Naturalizing is an assortment of bulbs that produce several long-lasting flowers in yellow or white. Some may even have soft pink or orange accents. The 4-in., trumpet-shaped flowers bloom from early to mid-spring. Daffodils are some of the best bulbs for naturalizing. With little care, they return spring after spring. For best results, plant in full sun to part shade. After they bloom, let the foliage mature and fade down naturally. Grow 16-18 in. tall. Deer tend to avoid. 12-14 cm. 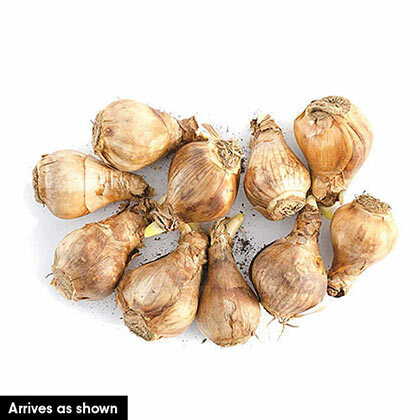 bulbs. Zones 3-8. FoliageRich, long green, strap-like leaves. BloomsEarly to mid spring flowering for about 10-15 days depending on the weather. Soil RequirementsWell-drained, loose, porous soil. PruningDead-head. Allow foliage to mature and die down naturally. The leaves are providing nourishment for bulbs to produce future growth and blooms. CommentsThis well-balanced assortment is the perfect choice for naturalizing, multiplying annually to improve your display! Each bulb produces several long-lasting flowers in yellow or white-with exciting accents of soft pink and eye-catching orange.